Home > Notions > Templates, etc. For anyone who has ever tried to piece half-square triangle units and thought "There must be a better way!" this product is for you! 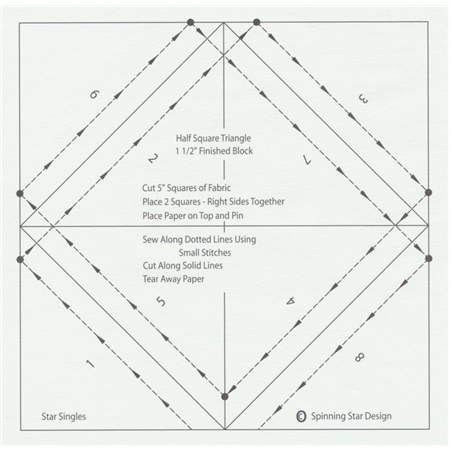 Star Singles are sheets of paper which you sew to your fabrics, creating perfect half-square triangles every time. Just pin to your fabric, stitch along the dotted lines, cut along the solid lines, and you're done! This package contains 125 sheets, which will create 1,000 half-square triangle units with a finished size of 1 1/2". Use these to create perfect pinwheel blocks, chevron blocks, flying geese blocks, and many more.